Black and white clothing labels are the most classic colour combinations for woven label design. They are sophisticated elegance for designer clothes labels. We can never deny the fact that the colour combination of black and white woven clothes label carries the most strong brand image. And they are the best way to build a successful brand image. How do we produce a woven label with black logo on white fabric? A simple answer to this question is that we use black thread and white thread in the jacquard weaving loom to create this classic brand woven label. 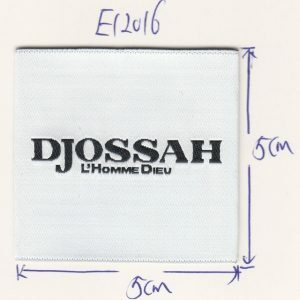 Some of our customers do not understand how woven labels are created, and that they wished the logo to be very black, and the ground colour to be very white. This is possible but not 100% achievable. At Perfect-Labels-Lanyards, we use double layers of white threads to weave the background colour to reduce the influence of black logo thread seeing through the white fabric. The end result with the extra layer of white thread (double white threads) on the background does help to create a good white fabric with black logo. But it is not 100% flawless white fabric, you can still feel a little light greyish shadow on the area where the black logo was created. Most of our brand customers are happy with this kind of end-result if they wished their brand designer labels to be made of woven and in black & white. For some other designers who wish to have a perfect flawless white fabric label, we will suggest them to consider the printed satin label, or printed cotton label. 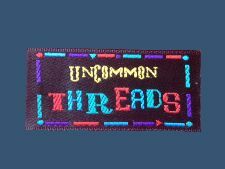 Looking for woven label design ideas? Contact us today, our contact details are here and send us your woven label design artwork; we will help to custom an outstanding brand woven clothes label that suits your brand design.